If your business depends on commercial transportation, you are aware that driver shortages continue to contribute to a sporadic shortfall of available trucking capacity. Analysts expect the current driver shortage, including the contributing factor of problematic driver retention, to remain a primary concern for the industry in 2019 and for several years down the road. The latest driver turnover statistic according to the ATA has improved slightly to 87% for Truckload carriers, which remains a significant challenge. The ATA also estimates the industry is short more than 50,000 drivers. 2018 driver wages grew at vastly different levels based on type, region, and truck market, but overall trucker pay was up around 10% on average over the year. Higher pay and better benefits will help ease the truck capacity shortage as new drivers are drawn to become truckers, but an increase in driver pay translates to similarly higher rates for shippers. Expectations for both driver wages and trucking rates suggest increases up about 3 to 5% on average this year. No one expects a repeat of 2018 in terms of demand. A general cooling of the economy and international concerns over tariff issues cause economists to predict stable GDP growth but slightly softer than the level of 2018. In 2019, the US-China Trade War, NAFTA, Global-National Regional Economies, e-commerce, and the political climate could each affect import volume and its associated shipping requirements. A volatile market often encourages a close look at transportation and logistics expenditures which are large cost drivers for manufacturers. Many manufacturers have built their supply chain over a span of decades and will find it challenging to establish new supply chains and avoid costly tariffs. The market and industry are constantly changing. Leading supply chain organizations stay ahead of the cycles. Take control of your supply chain by systematically and objectively analyzing your processes, systems and performance before making drastic changes. Implement steps which will help reduce your risk in the ever changing marketplace and keep you ahead of your competition. It may be an opportune time for a supply chain assessment by a qualified 3 Pl which specializes in supply chain technology and efficiency like Land Link Traffic Systems. Most logistics professionals are familiar with terms like IOT, Blockchain, and Artificial Intelligence. But do you know where in your supply chain implementation of these technologies might be useful? After a thorough assessment of existing supply chain protocols, areas of weakness can be identified and perhaps improved with some combination of these technologies. 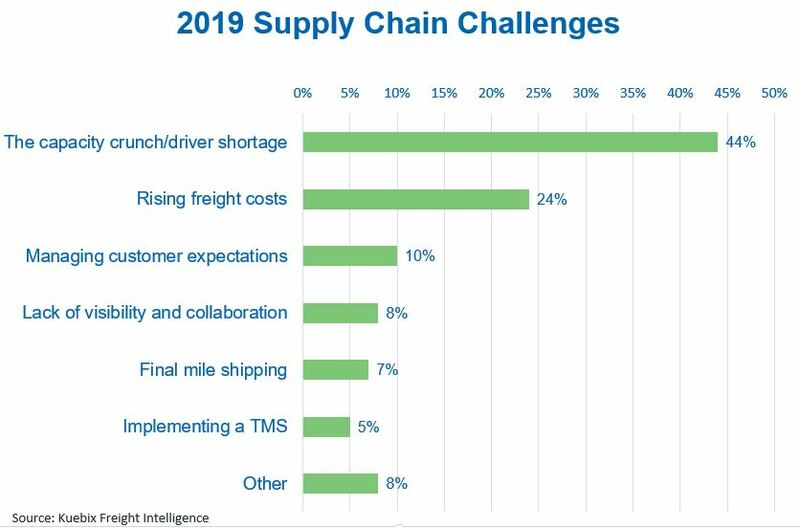 With 2019 continuing to be challenging, but albeit a somewhat watered down version of 2018, logistics planners will need to take steps to meet the challenges ahead while improving overall operational efficiencies. At Land Link Traffic Systems we offer over 40 years of industry expertise to your organization. In today's market it is all about the cumulative effect of the small changes which lead to increased efficiencies. Please contact us today for a comprehensive review of you current supply chain protocols. If we can't find room for improvement find comfort in a clean bill of health from some guys and gals who know the business.